The history of unionism in Ireland is a grateful subject for historians. Especially the first decades of the twentieth century provide ample stories of hard-fought successes and heroic defeats for those who strove to make the country a better place for the workingman. Most iconic of this struggle is of course the Great Dublin Lock-Out of 1913, about which you can read more here, and over here. James Larkin played an important role part in leading the strikers at the time, and although his approach was, and is being criticized, he became an icon for the men he led. After World War Two, he and his son aimed to bring unionism to Guinness. In the course of the twentieth century, unionism became an accepted phenomenon in the companies across the country. Not so at Guinness’s corporation however, where the companies’ directors managed to keep the unions outside St. James’s Gate for decades, due to a good care for their personnel as compared to working conditions elsewhere in the country. If you managed to get a permanent job at Guinness, you sat pretty for the rest of your life. However, at the brewery a great gap existed between the men who had learned a trade and the general workers, who had practically no voice in the company whatsoever. Duffy begins his story of unionism at Guinness Brewery after the end of World War Two and ends it at 1969, when unionism was firmly established at the brewery. Key players in this process were Sir Charles Harvey on the management side of the company and Jack Harte and Jack Carruthers on the workers’. After the war, the union came to Guinness in the person of James Larkin Jr., son of ‘Big Jim’, who took over the union activities of his father when the latter died in 1947. This included the leadership of the Workers Union of Ireland (WUI). 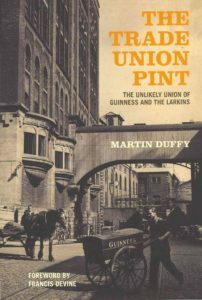 What follows in Duffy’s account is an extraordinary tale of the reluctance of the Guinness management to admit any union activity at all in the brewery, the struggle of the union to gain a foothold inside the company, and the eventual co-operation between management, union and workers’ delegates, in which Harvey, Harte and Carruthers played important parts. As Duffy makes clear in his introduction, he got the possibility to make use of the Guinness company’s archives in order to write this book. Reading the many insightful details of the company’s history in The Trade Union Pint it is obvious he did make good use of this opportunity. It is regrettable however, that the author didn’t include any notes or references to his sources for those who are triggered by the interesting content of his publication to learn more about the subject. Nevertheless, Duffy has done a nice job in putting to paper for the first time the history of unionism at Guinness Brewery, his book is a fine read and of great interest for anyone willing to know more about unionism in Ireland or the history of one of Dublin’s largest employers; Guinness.